Chris Bosh is an American former professional basketball player. A high school "Mr. Basketball" in Texas, Bosh left Georgia Tech after one season to enter the 2003 NBA draft. He was selected fourth overall by the Toronto Raptors in a draft class that included multiple future NBA superstars such as LeBron James, Dwyane Wade, and Carmelo Anthony. 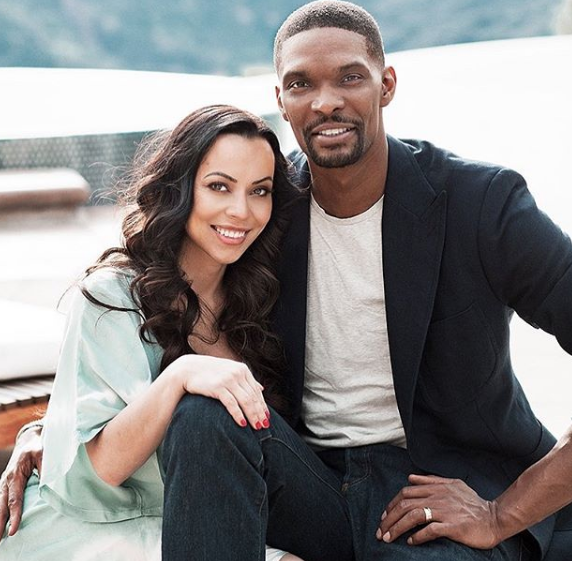 Seeking to promote sports and education amongst youths in Dallas and Toronto, Bosh set up the Chris Bosh Foundation and regularly speaks to youths about the benefits of reading. An American former professional NBA player. Playing alongside Lebron James in for the Miami Heat. The Heat’s ceremony took place at halftime of the team’s game against the Orlando Magic. Bosh was greeted with highlights of his six seasons in Miami, which included six All-Star appearances and two NBA titles. Bosh was also honored by Pat Riley, who assembled the Heatles that captivated the basketball world for four seasons. Then the jersey went up, as seen in the video atop this post. With his family looking on, Bosh had to hold back tears. Bosh gave a short speech to the crowd, recounting how he first met Pat Riley and dropping a quip about beating Wade to the jersey retirement party. The exercise ended the only way it could, with Bosh informing the crowd he was about to unleash one last scream. Bosh is the fourth Heat player to have his number retired and fifth overall, joining Alonzo Mourning, Shaquille O’Neal, Tim Hardaway, and Michael Jordan. Chris Bosh was born in Dallas, Texas. His birth name is Christopher Wesson Bosh. He was born to parents Noel and Frieda Bosh. Chris had a love for basketball from a very young age. He began learning to play the game when he was only 4 years old. Moreover, Bosh’s parents were also incredibly supportive of his passion. Now looking at his education, Bosh joined Lincoln High School in Dallas. Whilst in the school, he was doing amazingly well in academics and extra-curricular activities too. Whilst graduating with honors, he even led his school team to the No. 1 ranking in the country. Bosh did so by winning the USA Today National Championship in a perfect season with 40 wins and no losses. He then joined Georgia Tech to study computer imaging and graphics designing. He was also able to do very well with the college team averaging 15.6 points in his freshman year. What team is Chris Bosh on? Toronto Raptors signed Chris Bosh in July 2003 in the NBA draft. During his rookie season, he battled against all his opponents who were taller and stronger than him. He was praised by his coaches for his willingness to play despite pain and injuries. During his rookie season, he averaged 11.5 points, 7.4 rebounds, and 1.4 blocks in 75 games. Subsequently, he was selected to NBA All-Rookie First Team for the 2003–04 season. In December 2004 he became the leader of the team, and in every game that followed, he improved the stats of the previous leader. Subsequently, he was awarded the NBA Eastern Conference Player of the Week. He ended 2004-05 season as the leading scorer and leading rebounder. In February 2006, he was selected to play in the NBA All-Star Game. He was the third Raptor, after Carter and Antonio Davis, to play an All-Star game. He finished the season 27-55 and averaged 22.5 points, 9.2 rebounds, and 2.6 assists per game. In July 2006, he signed a contract extension for three years with NBA, with a player option for a fourth year. The deal was worth US$65 million over four years. His performance gained him the status of the All-Star starter for the East in the 2007 NBA All-Star Game. He received the second highest votes among the Eastern Conference forwards. On January 31, 2007, he scored a 65-foot buzzer-beating shot in a game against the Washington Wizards. He was selected Eastern Conference Player of the Month. In February, he scored his career-high 41 points. On March 28, 2007, he became the record holder for double-doubles against the Miami Heat, and he was named Eastern Conference Player of the Week for the third time and was selected to the All-NBA Second Team. Bosh had a slow start in the 2007–08 season, but by mid-season, he picked up and was once again named Player of the Week. This was followed by his selection to the Eastern Conference team for the 2008 NBA All-Star Game. He started 2008-09 season strong and was named Eastern Conference Player of the Week for the fifth time. However, the Raptors did not do well. Bosh's scored his career-high 22.7 points per game. In April 2009, he was offered a contract extension, which he declined. To prepare for the 2009-10 season, Bosh got trained under Ken Roberson and added 20 pounds to bring his weight up to 250 pounds. He opened the season with a win against Cleveland Cavaliers. He averaged 25.4 points and 11.9 rebounds in 16 games, but the Raptors won just seven games. In January 2010, he became Toronto's all-time leader in total points scored. He was one of two players in the league who averaged at least 20 points and 10 rebounds per game. On January 20, 2010, he scored a career-high 44 points against the Milwaukee Bucks but lost the game. In March 2010, he became the Raptors' all-time leader in the number of double-doubles in a season. In April 2010, he was named the Eastern Conference Player of the Week for the seventh time. He then parted ways with the Raptors and in July 2010, he signed a trade deal with the Miami Heat, teaming up with LeBron James and Dwyane Wade. Heat finished the season with 58 wins and faced Philadelphia in the first round of the playoffs. They won the series in five games and prevailed in five games in the semi-finals against Boston. In the Conference Finals against Chicago, Bosh averaged 23.2 points in the 4-1 series win. Against Dallas, he gave Miami a 2-1 lead. But Miami lost the championship. In January 2012, Bosh led Miami to a victory against the Atlanta Hawks. In the Conference Semifinals, he was injured and missed the rest of the series. But in the final game, he scored 19 points and took Miami to NBA Finals against Oklahoma City Thunder. Miami achieved a victory, and Bosh gained his first NBA Championship. In the 2012-13 season, Heat faced San Antonio Spurs. Bosh helped to secure Heat's victory in the series to claim their second consecutive NBA Championship. In the 2013-14 season, he hit a career-high 74 three-point shots. In the playoffs, he helped Heat to advance to the NBA Finals, where they faced Spurs again. This time, Heat lost the series. In July 2014, he re-signed with the Miami. During the 2014-15 season, he stopped playing due to injury and missed eight games. He returned in December against the Orlando Magic. In February 2015, he was ruled out for the season as he was diagnosed with a blood clot in one of his lungs. He returned in October 2015, against Charlotte Hornets. On November 10, 2015, he scored a season-high 30 points and won against the Los Angeles Lakers. In December 2015, he hit a career-best 5-of-5 against the Brooklyn Nets, and in January 2016, he recorded a season-high 31 points and 11 rebounds in a win over the Indiana Pacers. In 2016, he could not play due to a blood clot in his leg. In September, he failed his physical test. Thus Heat president Pat Riley had to end Bosh’s career with the organization due to his health issue. Out of respect, he said that no other player would ever wear the number 1 jersey which Bosh used to wear. 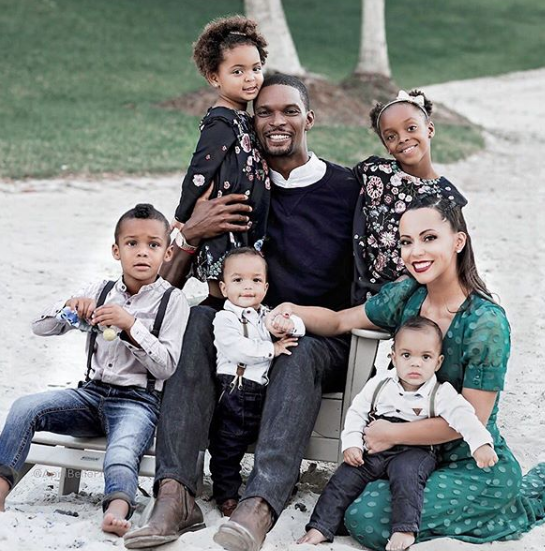 In November 2017, Bosh noted that he planned to "keep [his] options open as a player", and in February 2018, he declared himself on the comeback trail, having refused to rule out a return to the NBA. On February 4, 2019, the Heat announced they would retire Bosh's No. 1 jersey on March 26. On February 12, Bosh announced that he was no longer pursuing his NBA career and that he planned to retire from the NBA when his jersey is retired by the Heat. Chris Bosh was the Bronze medal winner with Team USA at the 2006 FIBA World Championship. He won the NBA Eastern Conference Player of the Week nine times and NBA Eastern Conference Player of the Month in January 2007. He was the NBA Atlantic Division Champion in 2007 and won the NBA Southeast Division Champion four times. He was an NBA All-Star 11 times. He won an Olympic gold medal in 2008. He was the NBA Champion twice, in 2012 and 2013. Now coming to the personal aspects of Chris’s life, he is a happily married man and has been together with his wife Adrienne Williams for quite some time now. The two said their vows in 2011 and have three sons, Dylan, Jackson, Lennox, and a daughter Pheonix, together. Moreover, Chris also has a daughter Trinity from his last relationship. Bosh has also had a few health issues. He was diagnosed with a blood clot in his lung. Whilst he did treat himself, the problem came back again in 2016. This time he was diagnosed with blood clot in his leg. This particular issue meant that his career had to be cut short. Despite struggling with these injuries, Bosh never gave up and kept fighting. How much money is Chris Bosh worth? For many years now, Chris has been one of the best players NBA has ever seen. He has been able to establish himself for his amazing work ethic and passion for the game. He is also one of the highest earning players in the game. Reports suggest that Bosh has a net worth of $50 million. Despite making all that money, he has also gone on to help other people. Chris has established the Chris Bosh Foundation to help young people in Toronto and Dallas with their academics and athletics. Bosh is also pretty active on social media platforms. He has a massive fanbase on Instagram with over 2 million followers. Chris goes by the handle @chrisbosh on the platform, so be sure to follow him. Observing his body statistics, He stands a height of 6 feet 11 inches and weighs around 235 lbs. Similarly, he has a pair of brown eyes and black hair color. Furthermore, He has an athletic body build. His other body information was not disclosed yet. In the case of disclosed, we will let you know. He has a daughter named Trinity with an ex-girlfriend Allison Mathis. He took retire from NBA on March 26, 2019. He has signed the sponsorship contracts with Nike, Panini, and some other companies.